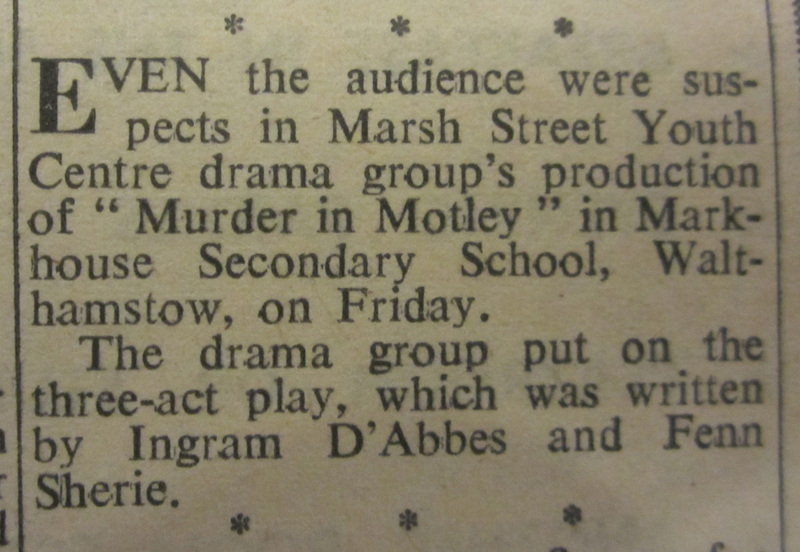 ‘Murder in Motley’ was a 3 Act Play with, according to the programme, ‘the action taking place in the Drawing Room of Aston House; the home of Sir William Ainslie. 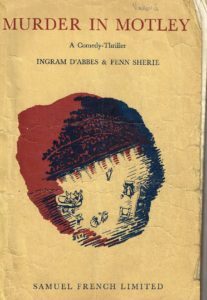 The first part of the programme shows an initial cast list with a note advising the audience that in order ‘to enhance your enjoyment of this play PLEASE DO NOT BREAK THE SEAL until the first interval’ – so presumably the following page was in some way taped down with the intention of not being immediately available to read? The following page – which we will assume was dutifully opened by 100% of the audience only at the end of Act One, reveals a further cast list. Both cast lists are noted below – with the hope that one of their number will remember the reasons for the above instructions. No rewards are available for the answer – but it would be an interesting addition to make to the record of this particular play! 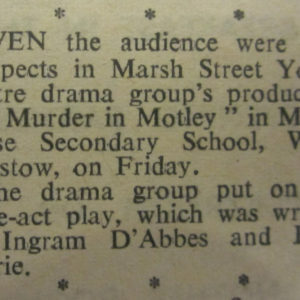 All the photographs of ‘Murder in Motley’ are copyrighted to CMMF/Markhouse Drama Club. As the second and third photographs show Iris, who was Stage Manager in this production, this suggests that these were taken at a rehearsal?